event of a supply air-failure. The HTXL Series mount directly to many of the most popular rack and pinion	style actuators on the market, and does not require a bracket between the pneumatic actuator and de-clutch override. The units come complete with a	coupler that connects the pneumatic actuator to the valve. Compact and simply design, light in weight. Manufactured with cast iron housing. Easy for customer to choose relative position between gear operator and valve, with two keyway apart 90~ in the inner hole of worm gear. 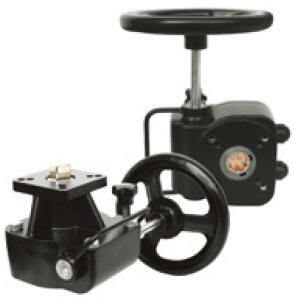 Easy to realize the manual drive or the pneumatic drive with the place-pin. Output torque ranges from 300 to 22100N.m. Note:All dimensions are in mm. Dimensions for reference only, subject to change.